"Hey, can I tell you who I am?" "I know who you are," THIS_IS_DILLARD answered. One of the hottest takes of the time about his arrest back in 1996, was that this just proved that the Dallas Cowboys were too bombastic, full of themselves, and entitled. 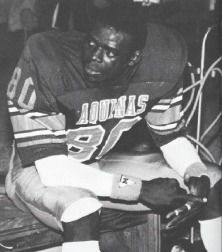 It is Michael Irvin, and video of him playing in hs is below. He is #80. Another great player on that team was Walker "Slip" Watkins at rb, who had elite speed and was a track star in college..